Nico Rosberg's pole position was always going to come under threat from Sebastian Vettel, but no one could have predicted how the Mercedes duo would have to fight for positions as they struggled for pace. There were overtaking moves throughout the race, very little time to stop and take stock, and a chase for the podium through to the chequered flag - for the second race in a row. Relive all the build-up, minute by minute, all the action, lap by lap, and all the reaction, quote by quote, as the Bahrain Grand Prix unfolded. Hello, welcome, today is the day for the Bahrain Grand Prix. Are you ready? We have one hour to go before the race begins, plenty of time to prepare, to ponder and to predict. Lots of cake in the paddock today. Nico Rosberg starts the race from pole position, after a great lap in the Mercedes. Sebastian Vettel will line up on the front row alongside him. Force India have a good starting position, benefitting from strong qualifying and other drivers' penalties - fifth and sixth on the grid. It's also worth noting that the fastest lap of the race in Bahrain last year was set by Sebastian Vettel, a 1:36.379. The pit lane has opened, so engines are firing up and cars are leaving the garage to make their way to the grid. Adrian Sutil gets in the zone before heading to the grid, via @clubforce. Question from the comments: "on the lap data (factbyte factbox) is 2.5Kg of fuel consumption is per lap or sector ?" It is per lap. Valtteri Bottas takes up his fifteenth place grid slot, via @WilliamsF1Team. Ross Brawn: "Tyres, we all know are the big issue. Temperatures are just starting to drop now, but they've reached the highest we've seen all weekend. We're in the land of the unknown, it'll be tough." Adrian Sutil: "Very good grid position, I'm happy. Very good position to be for the race. My eyes are always to the front, there are good guys around here, but the podium is where I want to be. Hopefully, with the right strategy we can gain a few places more. "Massa has an interesting strategy, no one knows how it's going to be. Maybe on the start he will lose a little bit, but the tyres are very similar." Sergio Pérez exits the McLaren garage ahead of the Bahrain Grand Prix, via @TheFifthDriver. Stefano Domenicali: "We'll try to do the best race we can, but today the conditions are interesting - much more hot. We have two different specs of tyres on the grid, let's hope one is better than the other. "When the lights will be off, who knows what is going to happen? But it's good to start in this position, a consistent pace in qualifying, to start in the second row is not bad." Jules Bianchi: "Looking forward to the race, it will be a tough race compared to the first three. We try our best and try to finish in the best position we can. It's been a bit more difficult here, we'll see in the race, it's different conditions in the race, tyre degradation, we'll see." Everyone's favourite Ferrari race engineer Rob Smedley, stands on the grid fluttering the front of his red shirt - it's definitely hot out there. Five minutes left to the start now, mechanics making their last minute preparations and drivers jumping into the cars to get ready. The polls are closed and 41% think the winner will be Fernando Alonso, with 18% favouring Felipe Massa. 73% of Sidepodcast readers think a three stop strategy will win the Grand Prix - which would make Pirelli's suggested ideal strategy correct. 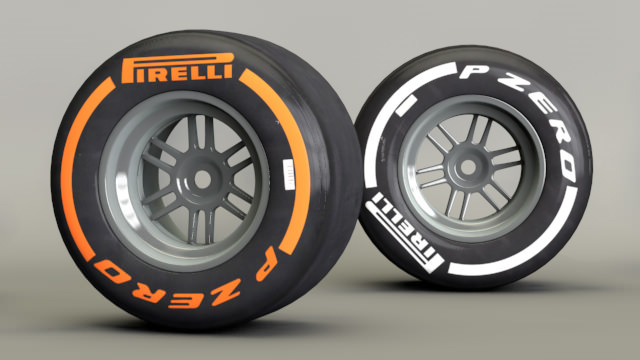 Hard and medium compounds from Pirelli this weekend. Two DRS zones on the track today, the first is detected just before the final corner and activated down the long home straight. The second is on the parallel straight, halfway through the lap. The tyre blankets come off, and F1 personnel clear the grid. The formation lap is about to get underway. Rosberg has a slow getaway off the formation lap, but gets back ahead of Sebastian Vettel into the first corner. There's a lot of weaving from side to side down each available straight, trying to get temperature into that Pirelli rubber. The top ten are all starting on medium compounds, except for Felipe Massa who has the orange sidewalls attached to his car. Tweet from @redbullracing: It’s pretty windy out there on track with the breeze head on down the pit straight. Could make DRS use a bit trickier. Rosberg pulls to a halt on the first grid slot, the field form up behind him. Vettel gets a great start but Rosberg closes the door on him and sweeps in front to block the Red Bull. Alonso moves up to second. Felipe Massa has lost heaps of places off the start, but he's salvaged fifth for now. Alonso is hustling Vettel for second place, but the Red Bull has hold of the position for now. Sutil has dropped back to sixth place, the Force India is running quite slowly. Yellow flags as Sutil drops further and further back. Esteban Gutiérrez has pitted from last on the grid. As Rosberg crosses the line to start the second lap, Vettel moves up alongside him to try and take the lead. He hasn't got the pace there, but into turn four, he makes the move. Then the Red Bull driver runs wide at the next corner and Rosberg moves back in front. Alonso is closing up to join the fight too. It's nose to tail at the front, Rosberg doesn't have the pace to hold them off forever, but he's got his defensive driving moves down! Vergne has been called into the pits due to a puncture, and Van der Garde has also taken an early pit stop. Vettel finally makes the move stick, sweeping past the Mercedes driver for the lead. Alonso now noses towards Rosberg. 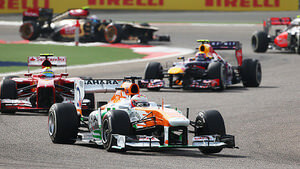 Behind them, Di Resta is in fourth, with Massa behind. Button has moved up to seventh, as Hamilton dropped back to 11th. Alonso makes a pass on Rosberg, but this Mercedes driver is not giving anything away easily, he takes the place back as they head into the first corner. Alonso makes the move on this lap, second place for the Ferrari as Vettel streaks away in the lead. Massa, meanwhile, on those harder tyres, sits fifth. Giedo van der Garde came in for a new nose, Sutil has rejoined the action, and Vergne is also back on track but one lap down already. Paul di Resta makes a pass on the Mercedes down, a Force India up into third! Impressive stuff. On board footage from Massa's car shows some front left fluttering, his front wing a little damaged, but not affecting the pace too much yet. Massa is attempting to pass Rosberg, as Di Resta is hunting down Alonso for second position. Rosberg has all areas of the track covered, he may not have the pace, but he's making his car as wide as possible to defend himself. The DRS on Alonso's rear wing appears to be stuck open, he has to head into the pits. A quick pit stop for Ferrari and they give the rear wing a whack to close it. Last time we saw this, Schumacher's DRS was stuck open and he was forced to retire. Webber pits and Grosjean behind him. Meanwhile, Alonso tries out his DRS but it gets stuck again. He won't be able to use it this race. Felipe Massa makes it past Nico Rosberg to move up into third place. Alonso takes his second stop for the DRS to be closed, but he's way down the order and minus the benefit of DRS. Button, Ricciardo and Bianchi all pit. Vettel, Massa, Pérez, Hamilton, Maldonado all come into the pits. Busy moment for the mechanics! Paul di Resta moves into the lead of the race. As Pérez left the pit lane, he narrowly had to avoid Romain Grosjean who took the outside line to stay ahead. The McLaren looks ready to make a move though. Jenson Button makes a move on Rosberg, taking advantage of the DRS to squeak ahead of the Mercedes. Even with one stop under his belt, Rosberg is still struggling for pace. A quick stop from Williams, as Maldonado goes on his way, via @WilliamsF1Team. Massa, Grosjean and Pérez are scrapping for 8th, 9th and 10th - they are so close it's painful to watch! Pérez pulls alongside Grosjean, but has to give it up as he runs out of corner to make the move. It's a huge fight for 8th, but they're dropping back from the battle ahead now. Di Resta pitted which put Räikkönen into the lead of the race, but only momentarily as Vettel makes the move and recovers his P1 position. Kimi Räikkönen is the only driver not to have stopped yet. Fernando Alonso is up to 13th place now, he's got Pastor Maldonado ahead of him. Kimi Räikkönen comes into the pit lane, a long first stint for the Lotus. Blue flags starting to be shown at the back of the field already, as the leaders start to make their way through. Replays of the Lotus pit stop show a slow getaway for the car, with just a few tenths lost. Sergio Pérez appears to be driving around with part of his front wing missing, and Lotus appear to have a bit of a McLaren front wing in their garage after Perez's pit stop. Felipe Massa comes in for a stop, and they didn't change the front wing on that Ferrari, so they're happy with the compromise of broken front wing/pace. Jean-Éric Vergne has been called to the pit lane, he's being pushed back into the garage with too much damage from an earlier accident. Adrian Sutil pits from 20th place, he's tucked away at the back of the field after a collision with Massa earlier in the race. Jenson Button passes Rosberg for third, and before another corner has passed, Romain Grosjean has made the move as well. Felipe Massa is instructed to drive flat out, as fast as the car can possibly go, if he wants any hope of his strategy working. Nico Rosberg and Sergio Pérez come in for their second stops. Webber and Button are next to come in for their second stops of the day. Di Resta is back up into the podium positions again. Lewis Hamilton has been told to lift and coast, the Mercedes pit wall concerned about fuel consumption again. Rosberg's defensive driving getting ever more erratic, as Sergio Pérez passes him for tenth place. Hamilton, after complaining on the radio about his rear tyres, comes in for a pit stop. Rosberg has managed to get back in front of Pérez, who in turn has his teammate Button behind him. Down the home straight, both McLaren's managed to get past Rosberg, Button had to fight into the first corner, but they both stay ahead. Vettel comes in for his second stop of the day, he'd managed to pull out a twenty second gap at the front, but where will he come out? Hard tyres go on the Red Bull in a super-quick stop, and Vettel returns to the track in the lead. Hamilton is currently sitting in 12th place, just behind Bottas. Behind the McLaren driver is Fernando Alonso, not making much progress from 13th. Nico Hülkenberg pits from 12th place, as out on track, Paul di Resta passes Romain Grosjean to move back into second place. Grosjean pits and returns to the track behind Felipe Massa, ninth place for the Lotus. Teammate Kimi Räikkönen is currently third, but has only stopped once. Sergio Pérez pulls out alongside teammate Jenson Button down the home straight, the McLarens are side by side round the first couple of corners, but Button keeps the position. Pérez gets a bit too close to the car in front, and a bit of carbon fibre front wing goes flying. Martin Whitmarsh looks on from the pit wall. Team radio from Jenson Button: "He just hit me on the back. Calm him down." As the two McLaren drivers scrap between themselves, Nico Rosberg moves back towards them, hoping to recover some of his lost positions. They're at it again, Pérez and Button, side by side into the first few corners. Button pushes Pérez off the track, so Sergio has to back down again for now. Romain Grosjean is getting involved in the McLaren battle, fighting past Sergio Pérez to move up to 6th place. Kimi Räikkönen pulls out onto the dirty side of the track to pass Paul di Resta for second place. He's got a way to go to chase down Vettel though. Romain Grosjean passes another McLaren and moves up to 5th place. Jenson Button has given up and come into the pit lane, fresh tyres for the ongoing battle for fifth place! Quite a slow stop for McLaren, relatively speaking, 3.4 seconds. Rosberg takes 10th place from Maldonado just before turn 11. Lewis Hamilton has passed Sergio Pérez for tenth place, the two Mercedes drivers finding some pace at last! Felipe Massa has come in for his fourth stop of the day. Somehow Alonso was ahead of him, and has done less stops despite a broken DRS. Ah, it looks like a right rear puncture for Massa. The Ferrari mechanics pull off the shredded rubber and replace it with a fresh tyre. Replays show the tyre just gave up, no contact with anyone or any kerbs. Räikkönen moves up again, he's up to fourth place. It was a shrewd move, saving the overtake for the second DRS zone so the McLaren has no recourse... yet. Hamilton comes in for his third stop of the day. Grosjean instructed to push over the radio, he's got clear air ahead of him as he's now in second place behind Vettel. Incident involving Webber and Rosberg under investigation - causing a collision. Pérez comes in for his third stop of the afternoon, and Alonso follows him in and out for his fourth. Eric Boullier from the pit wall on Grosjean's projected finish: "Should be fighting for fifth place with Mark Webber." Sebastian Vettel pits from the lead of the race, it's a reasonable stop and he's off again, back into the lead with no problems at all. Romain Grosjean comes in for his last pit stop, he left the track third and returns alongside Jenson Button, managing to muscle his way past the McLaren taking fifth. Incident involving Webber and Rosberg will be investigated after the race. Grosjean makes it past Webber, moving up to fourth place. That's one step more than his team principal expected! Vettel leading the race, then, with Räikkönen and Di Resta behind (two stops each), and Grosjean in fourth. Nico Rosberg managed to get past Button on the last lap, but then came into the pitlane. This time round, it's the other Mercedes of Hamilton that passes the McLaren for track position. Fernando Alonso has pushed his way past Jenson Button, moving up to eighth place. Button not looking at all happy right now. And the McLaren driver dives into the pitlane, Button taking his fourth stop of the day. Alonso is on a mission now, he overtakes Pérez for 7th place, although the McLaren driver isn't giving it up easily. Paul di Resta has been on the radio complaining about not seeing any blue flags, and of course, the telemetry and signalling system from Race Control is broken at the moment. Grosjean is hunting down Paul di Resta for the final podium position, the gap is heading down to a second, where DRS will be enabled. Hamilton makes his way past Mark Webber, sneaking up the inside of the Red Bull to take fifth place. Incident involving Giedo van der Garde will be investigated after the race - unsafe release. Down the home straight, Grosjean closes the gap to the Force India, takes the slipstream, pulls alongside and past, moving up to third place. Replays of the Van der Garde pit stop show it was close with an incoming Marussia, but they didn't collide. Hamilton outbraked himself to allow Webber to close right up, the Red Bull takes his position back through turn 14, and Hamilton has to do it all over again. Sergio Pérez pulls alongside the Ferrari of Alonso, and they fight their way through several corners. Alonso is pushed off track and loses the position, but he's not giving up yet. The fight continues between Webber and Hamilton, they are side by side heading towards turn four and beyond. Webber keeps the position for now, Hamilton is still right there. It's close again at the same point of the track as last time, Hamilton doesn't seem to have the edge on the Red Bull this lap though. Vettel begins his final lap, and is instructed over the radio to keep control, stop pushing quite so hard. Sebastian Vettel wins the Bahrain Grand Prix! Kimi Räikkönen and Romain Grosjean follow along behind for a double Lotus podium. Looks like there was a fab battle between Webber, Hamilton and Pérez in that final lap but we weren't allowed to see it. Hamilton got fifth place, with Pérez behind him, and Webber losing two positions in the final lap. Sebastian Vettel climbs from his car and... wait for it... yep, there's that finger again. The drivers take to the podium as the national anthem of Germany plays out. Podium quotes - Sebastian Vettel: "Big, big thank you to the team today. Seamless race from start to finish. I knew it was crucial after the start to get into the lead if I can, then go from there, look after the tyres. The pace was phenomenal, the car was very quick. A beautiful race where you could push every single lap. Overall very happy. "It was tight in the first corner with Fernando on the outside, I had to give way, I wanted to line it up to get Nico on the next straight. Fernando squeezed in, but then I got him back... Nico was a tough one, he was quite quick on the straights. The headwind helped the cars behind... out of turn four, I managed to save KERS up and pass him on the inside. Then the track was clear and we managed to unfold the true pace of the car." Podium quotes - Kimi Räikkönen: "Yesterday wasn't ideal, so we plan to try to do two stops, today it worked well so we gained a lot of places. I didn't have a very strong first and second lap, so we lost two places, but after that the car started to come to me and I could start pushing more and more and the end was okay." Podium quotes - Romain Grosjean: "First three races have been consistent but not where we wanted. We worked hard, the whole team, it wasn't easy to find out what was missing... but basically today we got it. Started the race, the strategy a bit different to everybody... the race was a bit harder, we had to have some good fights on track, but that's why we're racing, what we enjoy. Very pleased to be here." Tweet from @MercedesAMGF1: Tough #Bahrain GP for the team, with Lewis in P5 and Nico P9. Work to do before #F1 moves back to Europe but we'll keep fighting as usual! What an incredible race, and in Bahrain as well! Previously known for its dull action, the event certainly delivered today. I, for one, am happily exhausted. Great result for Lotus, and Force India did well despite some difficult racing. They have moved ahead of McLaren in the standings again. We've got another three week break now before Formula One returns to Europe and the Spanish Grand Prix. There should be upgrades galore, so yet more unpredictability. I can't wait! Thanks for joining me this weekend, stay tuned to https://sidepodcast.com and http://f1minute.com for all the news and views you need - and be back here in three weeks for more factbyting fun!